This week on #TakeOutTheater: A movie so f**king funny, you’ll f**king laugh yourself into f**king paralysis. A military invasion under false intelligence. The U.S. and U.K. rushing towards war, with very little in the way to stop them. And at the center of it all is one bumbling minister, his equally bumbling aide, and a really angry, foul-mouthed man trying to keep everything and everyone toeing the Party Line. You might think you’re watching a movie set in the very real time frame of 2002 – 2003, but you’re really not. No, this story takes place somewhere completely different… And yet not that different at all. 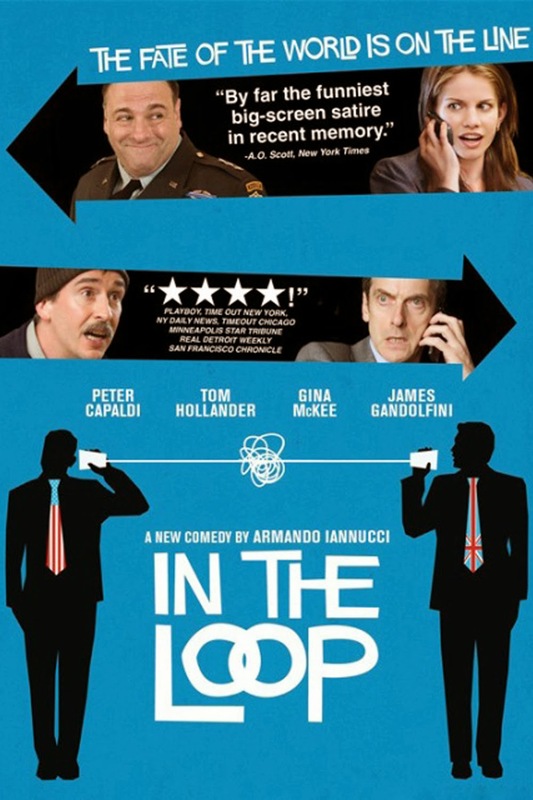 This movie takes place where anyone who’s anyone resides, In The Loop. Simon Foster (Tom Hollander) is the Minister for Foreign Development for the British Government. 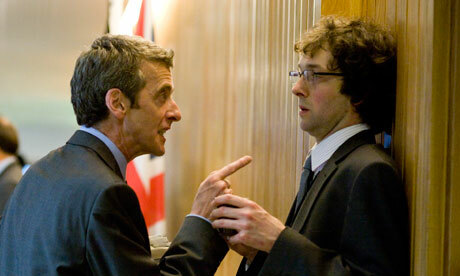 Malcolm Tucker (Peter Capaldi) is the Prime Minister’s Director of Communications, and unofficial enforcer. These two men would only meet under a particular set of circumstances, and unfortunately for them (and for us) they do. It’s all because Foster has made an offhanded comment that “war is unforseeable” in the Middle East. With one wrong statement, a snowball of blunders, flusters, threats, and beratement the sh*t starts to roll down a “Mountain of Conflict.” If they’re lucky, they might just get out of this without an international incident. If not, then the “Road to Peace” might be as dangerous as that aforementioned mountain is. Armando Iannucci’s wildly brilliant BBC sitcom, The Thick Of It, made its film transfer to a more international audience in 2009, with a film that heavily lampooned the reality of the Iraq War and how it was enabled by the “Special Relationship” between the U.S. and Great Britain. Iannucci was particularly adept at mocking this subject, as his character of Malcolm Tucker (one of the only two characters that is a direct transfer from the original source material) was a satirical version of Tony Blair’s Director of Communications & Strategy, Alastair Campbell. As the man who contributes to the rougher side of 10 Downing Street, Tucker is a fierce opponent to anyone who stands in his way. He does not accept incompetence, he will not honor pretty boys, and he’s always got a dose of “violent, sexual imagery” to dispense to those who can’t keep it together. It is this character that steals the original material, and it is Capaldi’s performance that also steals and galvanizes this film’s hysterically dark path. Filled with more insulting nicknames, pop culture put downs, and personal attacks than a “Dance Moms” reunion, Iannucci is a profane poet in league with Mamet and Scorsese. The plot is a pretty basic one, and the scenery isn’t really all that breathtaking, but the performances are what will sell you on this movie. The ensemble cast on display in this film (which includes the late James Gandolfini, as an anti-war Pentagon general) is nothing short of top tier. When you have a film about language and its many quirks and pratfalls, it helps if you have people that know how to deliver the material. Nuance is king in a film like this, and the fact that the script was nominated for an Academy Award (2010 – Best Adapted Screenplay) only furthers the importance of finding the right actors and actresses for this project. Much like some of Iannucci’s work (which in this case is supplimented by his usually terriffic writing team of Jessie Armstrong, Simon Blackwell, and Tony Roache) though, the film has a shift in tone that turns bleaker than the rest of the picture lets on. That’s because ultimately, his work isn’t only designed to make us laugh at what’s happening, but also to make us think pretty long and hard about the fact that the real world is absurd in its own right enough to lend credibility to this fiction. You’ll laugh, you’ll write down quotes, you’ll even question the state of the world’s political systems. All of this and more await you, In The Loop. 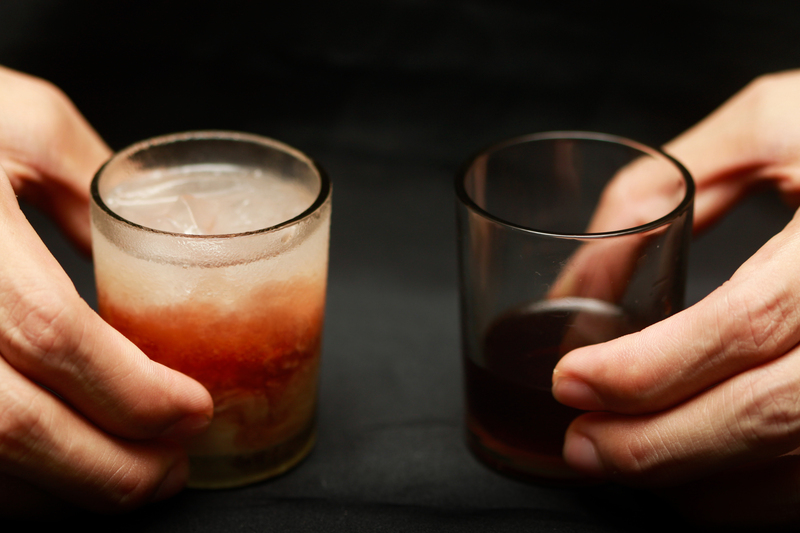 Create a White Russian shooter in a cocktail shaker, by measuring equal 1 ounce parts of Kahlúa®, vodka, and cream. Shake well and pour into a tall glass. Pour the Jägermeister® into a separate shot glass. Slam the White Russian shooter and immediately chase it with the Jägermeister®. Thanks to Juan over at WikiHow for the awesome recipe, and thanks to all of you for sticking around for another installment of #TakeOutTheater. Have a suggestion for a movie, drink, or pairing we should feature? Send it to us through Facebook, Twitter, the Comments section below, or email us.